She said that http://www.cjsewingroom.com/ is her favorite WAHM store! This also means that CJs Sewing Room is eligible to receive a free month of advertising here on The Cloth Chronicles!! 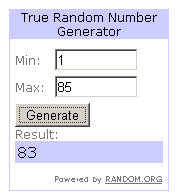 Robynn, please email me at iheartfluff@hotmail.com to claim your prize! I wanted to do a little something different for a giveaway. So, this week, I'll be giving one lucky I Heart Fluff fan a $15 gift certificate to their favorite WAHM and/or Cloth Diaper store! The WAHM store does not have to sell cloth diapers, I just ask that they at least carry products that are baby/child/pregnancy related. Also, if we can get to 200 blog followers by this Saturday, I'll be giving away another $5 gift certificate! Mandatory Entry: Fan I Heart Fluff on Facebook and comment on this blog post with your Facebook name (First name and last initial will work) and the link to your favorite WAHM store. Be sure to leave your email address if you'd like to receive an email if you win. Extra Entry: Follow our blog and leave a separate comment stating that you are a blog follower. To make the deal just a little bit sweeter, the favorite WAHM store of the winner will have the opportunity to receive free advertising for 1 month here on the blog!! Giveaway ends Monday, 9/6, and the winner will be announced Tuesday, 9/7, on the blog and facebook. The winner will have 48 hours to contact me at iheartfluff@hotmail.com to claim their prize. Audrey is the fantastic WAHM behind ABC: Audrey's Baby Creations. I was first introduced to her shop during our 1000 fans celebration on I Heart Fluff. Audrey was gracious enough to donate one of her adorable burp cloths and a $5 store credit to the celebration. If you have a little girl, her shop is a must for all the super cute bows and tutus. Don't have a girl? Well, you can also get car seat canopies, security blankets, toy/pacifier holders, plus so much more! "I am 23 years old. I have been married for 3 years and we have one little girl, Madalyn, who turns 'the big ONE' on Friday! I graduated in May 2009 with a Bachelor's degree in Early Childhood Education. I am currently enjoying being a stay at home mom. :) Madalyn was/is my inspiration behind all of my crafts. I enjoy this hobby and it helps bring in a little money, with my husband in his 2nd year of medical school. This is something I can continue to do no matter where we go. We won't be settled down anywhere for a while. Once medical school is over, my husband will owe the Air Force 4 years, as they are paying for his school. I don't always enjoy being a medical student/military wife, but I do appreciate all of his hard work!" 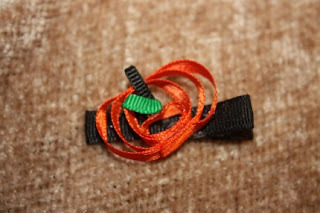 Pumpkin Clip - Perfect for Halloween! 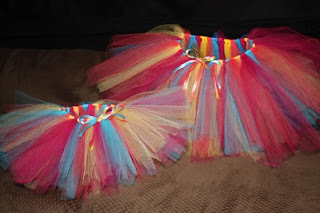 "I specialize in making hair bows (of all kinds), boutique style wipes cases, custom tutus, burp cloths, security blankets, pacifer clips, car seat canopies, and more! I started making all of my creations about 7 months ago, but I enjoy doing it, and don't sell anything I wouldn't be proud to have my child wear/accessorize with. :)"
Audrey is offering an extra special for our blog readers and Facebook fans! If you buy one pacifier/toy holder, you can get one half off!! ABC: Audrey's Baby Creations also has a referral program. If you refer a person and they mention your name, then you get 5% off your next order! The more people you refer, the more you save - up to 35% off an order (excluding shipping). 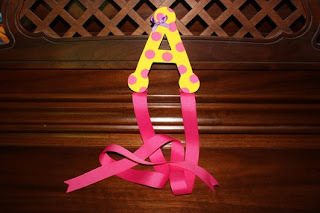 Make sure to like ABC: Audrey's Baby Creations on Facebook! They will be having a giveaway if they can reach 500 fans and have 6 sales by Friday. They only need 3 more sales and a little over 30 more fans to reach their goal! Thanks for being this week's featured WAHM Audrey! 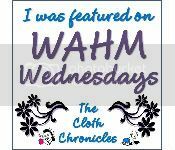 Feel free to grab the WAHM Wednesdays button when you get a chance! Okay, I admit it...cloth diapers make me giddy. Especially cloth diapers that are completely unique and adorable! I fell in love with ButterBears diapers when I first saw pictures on their website. They make tie-dye cloth diapers!!! Complete awesomeness!! ButterBears diapers are one-size pocket diapers. 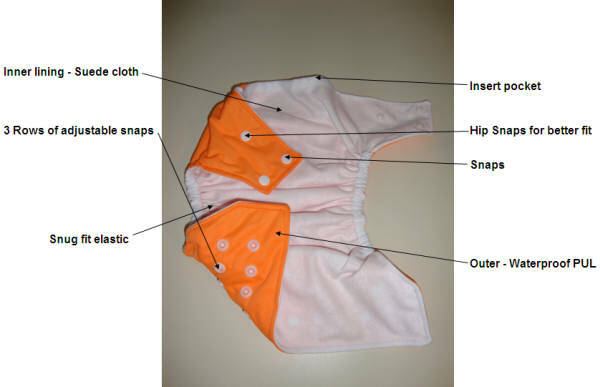 They come with a newborn insert and a regular insert and feature hip snaps for a better fit. No two tie-dye diapers are exactly alike! 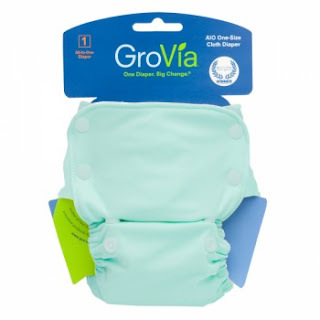 This is a great daytime diaper, especially if you have a typical toddler that is constantly on the go. The ButterBears diaper really keeps everything in and moves with the body so there's no shifting or creeping of the diaper while little man is climbing and crawling on top of everything. The night that little man wore his ButterBears diaper was one of those nights when he woke up almost every couple hours - thank you molars! So, we haven't actually tried it out for a full night yet, but it was on him for about 6 hours and we had no problems. I did use both the regular insert and the newborn insert for some extra absorbency. We've been having some problems with heat rashes from moisture sitting on his bum with some of our diapers, but the ButterBears diaper did a really good job of wicking the moisture away from his skin. The ButterBears diaper gets major cuteness points and it's also a very well made diaper! The snap sizing seems like it would fit a wide range of sizes and I love the fact that there are hip snaps to help hold the flaps down. It works great as a day or nighttime diaper and works wonderfully at wicking the moisture away from the skin while still keeping everything in. I wish I would've found out about these diapers sooner and I will definitely be adding more to our stash! You can go buy your own ButterBears Tie-Dye Diaper at http://www.mybutterbears.com/. Stay updated on everything ButterBears by visiting their Facebook page. Out of all the diaper fabrics we've used, I have to say that my absolute favorite is bamboo. Bamboo velour, bamboo jersey, bamboo terry...anything bamboo. So, I was thrilled to get my hands on a Little Comfort Trial Pack from Zabi Baby, which includes one Little Comfort one size fitted diaper with 2 boosters, 1 Little Comfort cover, and 2 disposable liners. "This One Size nappy fits from Birth to Potty. 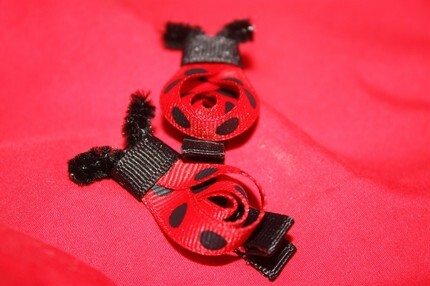 It contains 2 boosters, both a size 1 and size 2. When both boosters are snapped together it is suitable for night and very heavy wetting babies. One of the most absorbent and versatile nappies on the market. 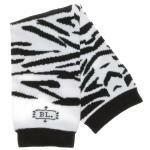 Extenders are available for babies that need those extra few inches around the waist. This nappy when used with extenders is larger than our regular Size 2 nappy. The polyester element of the nappy allows the nappy to dry quicker than 100% bamboo fabrics." I really like the packaging, both from a retailer and a consumer stand point. It's really nice to be able to get a set that includes both the diaper and the cover. One purchase and you're done. This is especially great if you're new to fitted diapers, or to the world of cloth all together. The Little Comfort cover is your standard diaper cover made out of PUL. They were originally only available in solid, neutral colors, but they've recently added some adorable prints. As soon as I had the diaper prepped, I put it on little man, using only one of the boosters. He had it on for a little over an hour before I put the diaper cover on him and the outside of the Little Comfort fitted was still dry. I would've left the cover off longer, but we had to head to the grocery store. Some fitted diapers are kind of bulky so it's hard to get little man's pants on over the diaper and cover, but the Little Comfort diapers are surprisingly trim when you use them with the Little Comfort diaper cover. I don't know if this is just a trait that my child has, but I swear it's like he has to break in new diapers and he poops in them the very first time he wears them! Every single one!! The good news is that we usually learn pretty quickly if we'll have any issues with blowouts. Of course, the Little Comfort diaper kept everything in. We used the diaper and cover a few more times since then and we still haven't had any issues with leaks or anything else getting out of the diaper. You know that the real diaper test doesn't happen until bedtime. 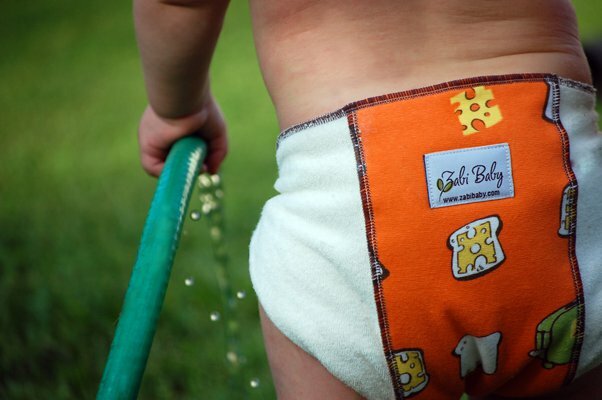 Not all diapers pass this test, especially when they're worn by a super soaker like my son! I put the Little Comfort fitted diaper, with both boosters, and the Little Comfort diaper cover on him around 8pm and he slept in it until around 6am the next morning. The diaper worked wonderfully! Little man was definitely wet when he woke up, but there were no leaks and his little bum wasn't red at all, so the diaper did a really good job of absorbing the wetness without the wetness really sitting against his skin. All in all, I think this is a fantastic diaper. The fitted diaper has stayed super soft through line drying and machine drying. We had no leaks, no blowouts, and little man seemed really comfortable in it. If I changed anything, I might make the laundry tabs on the cover just a tad bit longer so the velcro would stick a little better. Although, I really didn't have any more of a problem with the diaper chains with this cover than I do with any of my others. I would definitely buy more of these diapers and I'm really hoping to get one of the diaper covers with those super cute prints. Glorimar, owner of Zabi Baby, is offering my readers a 10% discount off their order at Zabi Baby using the code: DSM5. You can use this code to pick up your own Little Comfort trial pack (that's already 10% off!) or browse around her store. She carries other diaper brands, diaper accessories, and beautifully embellished prefolds. Winner is Comment #30 - Michelle (deltacogirl)!!! Last week, an I Heart Fluff fan won a Baltic Amber Teething Necklace from East Coast Cloth. 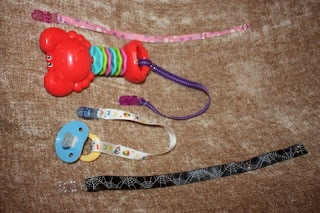 Because we referred her, I Heart Fluff also won a teething necklace! Of course, we're passing this giveaway right along to our fans! Up for grabs is a Baltic Amber Teething Necklace in your choice of Cherry & Lemon or Caramel color. Let me know which color you'd like by commenting on this post. Make sure to leave your email address also. Only one comment per person, please. Duplicate entries will be deleted. Giveaway ends 8/18 at 9am CST. Winner will be posted later that day. As many of you already know, I have a new found love for fitted diapers. They are super cute, easy, and their breathability makes them perfect for keeping your baby cool during these hot summer days! So, I was beside myself with excitement when Top to Bottom Baby Boutique offered me the chance to review a Monkey Snuggles fitted diaper. This diaper is FAN-TAS-TIC! The inside of the diaper is made of my absolute favorite fabric, organic bamboo velour (OBV). Seriously, there is nothing better to have against your baby's bum than super soft OBV! Then there is a layer of organic bamboo fleece and the outside is made with cotton knit fabric in all sorts of adorable prints. The Monkey Snuggles fitted diaper also includes two 4-layer velour topped snap in soakers. Of course, I wouldn't be gushing about how wonderful this diaper is if I hadn't put it through some tests first! The first time my son wore our Monkey Snuggles was at night. My son is a super soaker and it took us a little while to get a system down for a good nighttime solution. So, I'm always hesitant to try something new, but I figured we'd go for it. I put him in the Monkey Snuggles fitted diaper and a fleece cover at around 8pm. He woke up at 7 the next morning and I just knew I was going to have to change his sheets. I went into his bedroom and everything was completely dry - no leaks at all! I took off his fleece cover expecting the Monkey Snuggles to be completely soaked like some of our other fitteds. I was shocked! The outer part of the diaper was still dry!! It wasn't long before the skeptic side of me was saying things like, "He probably just didn't pee as much." and "I'm sure he wasn't moving around like he usually does, so the diaper just didn't get as squished around as much as the others." So, we tested it out during the day. I put the Monkey Snuggles on him - gasp - without a cover, which I never do, and sent him on his way. He crawled, climbed, walked, and rolled all over the place while wearing the diaper. After two hours of him constantly moving all over the house, there was not one leak and the outside of the diaper was still dry. Of course, it was time for a nap after all that running around. He only naps for about an hour, so I just put a cover over the Monkey Snuggles and put him to bed. When he woke up, the outside of the Monkey Snuggles was a little damp, but not soaked like some of our other fitteds would've been. All in all, I have to say that the Monkey Snuggles is a wonderful fitted diaper. I like the fact that the soakers snap in, so it doesn't take that long to dry. Hubby would like it better if it had velcro closures and 'not so many parts'. But, simple is better with him so we'll leave him the AIOs with velcro and I'll take the Monkey Snuggles any day!! Are you now wondering how you can get your very own Monkey Snuggles fitted diaper? Well, you can visit Top to Bottom Baby Boutique and use the code, FluffyLove, for 10% off your purchase (good until August 31st). You can also enter this fantastic giveaway for a $20 gift certificate from Top to Bottom Baby Boutique and use that to buy a Monkey Snuggles, or anything else your heart desires!! Visit Top to Bottom Baby Boutique, then comment on this post and tell me what you'd purchase from their store with a $20 gift certificate. *Only one comment per person please. Duplicate entries will be deleted. Giveaway ends Friday, August 13th and the winner will be announced Saturday, August 14th. Winner is Comment #27 - Jenn!! Like any good cloth diaper addict, I can remember the first cloth diapers I purchased and where I purchased them. In fact, some of our favorite diapers came from those first orders, including our BumGenius 3.0 and Blueberry diapers from Abby's Lane. ...to Zappy Zebra Babylegs and everything in between. So, how fantastic is it that Abby's Lane is offering one of our fans the chance to win a $20 gift certificate!?! Like Abby's Lane and I Heart Fluff on Facebook. Visit Abby's Lane and tell me what you'd use the gift certificate for by commenting on this post. *One comment per person, please. Duplicate entries will be deleted. Giveaway ends Thursday, August 12th. Winner will be announced on August 13th.